One Madascar Marsh Harrier was documented feeding on the eggs of a waterbird (likely a rail or a gallinule). The Peregrine Fund is working tirelessly in Madagascar to save habitats and biodiversity. 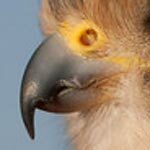 Three of 24 Malagasy raptor species are endangered, including the Madagascar Marsh Harrier. One of the most important actions we can take to save this species is the preservation of suitable habitats. In 2015, after years of working with local communities and government, The Peregrine Fund helped create three new areas which were give status as "National Protected Areas." This victory has increased protected habitat by 190,000 hectares and will provide protection for an untold number of endangered species. The Madagascar Marsh Harrier is found on the island nation of Madagascar and on the Comoro Islands in the Indian Ocean, from sea level to about 1,800 meters above sea level. Where would you guess that a species with the word "marsh" in its name likes to live? If you answered "marshes" you would be correct! The Madagascar March Harrier inhabits marshy and wet areas of all kinds, including rice paddies, shady plantations, and mangroves. But, it is also known to forage in drier habitats, such as savannas. Though it may seem strange, there actually aren't isn't much marshy habitat on the Comoros. So the Madagascar Marsh Harrier has adapted to living in drier habitats there - usually in open areas, such as grasslands and cultivation fields. Harriers, in general, are some of the msot beautiful raptor species in the world, particularly while soaring. In fact, harriers are famous for their graceful, low flights on dihedral wings - wings held up to form a "v". The Madagascar Marsh Harrier is no exception. It is a stunning bird and, like the Northern Harrier, the male and female differ in coloration. This is known as sexual dimorphism. In the case of the Madagascar Marsh Harrier, the male has a dark black back, a slaty-grey head and white streaks along its breast. The female is browner, overall. They both have bright yellow eyes and a distinctive facial disk. Right about now, you might be asking yourself what exactly is a facial disk? A facial disk is composed of feathers that form a circle around its face. The disk can be lifted or lowered at will. When the feathers of the facial disk are raised, they help direct sounds to the bird's ears. To see how this works, cup your hands behind your ears and listen. You might notice that whatever you are listening to seems louder. When a Madagascar Marsh Harrier is hunting over dense grass or other vegetation, it listens for the sounds of its prey scurrying below and knows where to aim its sharp talons. The Madagascar Marsh Harrier is a diurnal raptor - meaning it is active during the day and rests at night. Like most raptor species, the Madagascar Marsh Harrier is a great defender of its nesting territory. It will work hard to prevent other harriers and predators from getting too close. Their defense calls have been described as "ouek" and "kekekekeke." There are several threats to the Madagascar Marsh Harrier, including the conversion of marshes into rice fields, uncontrolled fires in savannas and grasslands, collection of young from nests for human consumption, and poaching. Up until 2012 the species was considered Vulnerable by BirdLife International. Today, it has been uplisted to Endangered. The Madagasar Marsh Harrier enjoys a diet of small vertebrates including birds, such as the Madagascar Partridge, rodents, turtles, frogs, snakes and chameleons. It also feeds largely on insects.Researchers observed one attack a Hottentot Teal - a type of duck - that had been shot, and another attempted to capture a half-grown chicken in a village. Like other harriers, it forages by flying low over vegetation and capturing prey by dropping rapidly to the ground and grasping prey in its talons. Before breeding begins, the male and female Madagascar Marsh Harrier engage in beautiful courtship activities including aerial displays performed by the males, vocalizations, food exchanges, and flights performed by both members of the pair. Researcher René de Roland described this exchange- "Aerial flight displays began with a spiraling, ascending flight by the male, then progressed to a fast hard flapping flight with steep undulations and then to a rapid descending spirals with "koue" vocalizations." He also described pair-formation flights in this way: "Pair-formation flights involved the male and female flying slowly together in their territory and sometimes stalling and grabbing at the other member of the pair." Though more studies need to be made, preliminary observations have revealed that the male does the majority of the nest-building. He builds a nest platform made of green plant and dried twigs, often from pine or eucalpytus trees. The nest is constructed on the ground or in low vegetation, most often in marshes. When the time is right, the female will lay 3-5 white eggs. She is responsible for all of the incubation - meaning she needs to sit on her eggs to keep them warm and safe for the roughly 32-34 days the embryos need to develop into healthy chicks. While the female is busy caring for her eggs, the male is bringing food to the nest for the female and helping to defend the nest against predators. When the chicks hatch they are small and covered in fluffy down. The female remains on or very close to the nest to ensure her young continue to be safe as they grow into healthy fledglings. While the female is holding down the fort, the male is off working hard to find food for his female and his offspring. When he arrives in the nest area with prey, he often vocalizes to the female to alert her of his arrival. The female responds back with vocalizations of her own. Prey exchanges are often conducted in mid-air, with the female taking the prey directly from the male's talons. When the nestlings are a bit older, around 24 days, the female will also leave the nest to help the male find food. The nestlings will continue to grow and gain strength and when they are about 42-45 days old then will fledge, or fly for the first time. When the young are around 70 days old, they will disperse from their natal territory. 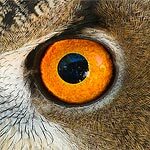 If you would like a chance to see a harrier in the wild, a visit to our World Center for Birds of Prey is a good place to start. Northern Harriers can be seen around The Peregrine Fund's World Center for Birds of Prey. As you drive up to the entrance, watch for them soaring low over the grassy fields on either side of the road. When walking our nature trail, be sure to look for these graceful, agile raptors. An interpretive sign at the end of the trail teaches you how to identify a raptor based on its silhouette. Additionally, the Velma Morrison Interpretive Center offers fun ways to learn about birds of prey. Interactive activities, tours, interesting videos and a children's room with activities from coloring sheets to quizzes to costumes are all available for our guests. We also have knowledgeable, on-site staff to answer any questions you may have about Madagascar Marsh Harriers, or any other bird of prey.